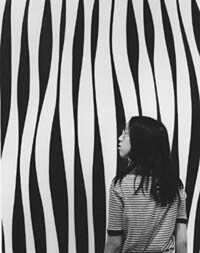 English literature student Lynn Wong takes in Rétine prétentieuse, 1965, by Marcel Barbeau. It was one of the works at Concordia's art gallery, seen by 800 people last Sunday. Last Sunday, Concordia's Leonard and Bina Ellen Gallery threw its doors open to 800 visitors. They were taking part in Museums Day, when Montrealers are given free bus rides to museums and galleries all over the city, thanks to sponsorship this year from American Express. The visitors enjoyed the current exhibit, Les mystères objectifs... The phrase, a reference to abstract art, comes from Le Refus global, the artistic manifesto whose 50th anniversary is being celebrated this summer all over Quebec. Les mystères objectifs... is a vibrant selection from the University's extensive permanent collection, and includes such names as Marcel Barbeau, Paul-Émile Borduas, Jean-Paul Riopelle, Jean McEwen, Jacques Hurtubise, Rita Letendre, Guido Molinari, Françoise Sullivan and Irene F. Whittome. You can catch the show until it closes on June 20.